Skype just asked me to rate my call with @IaninSheffield I didn’t notice any audio glitches but may have missed then as Ian was fascinating talking about his PHD research on twitter use by teachers. If you missed it catch the archive which will be on Radio #EDUtalk soon. via Is Twitter the Best Option for Online Professional Development? from the Hack Education blog. That would be a nice development in 2015. I’ve blogged a lot about twitter and while it continues to be a good tool, I’d go along with the questioning of best. I suspect our professional standards are looking for a bit more depth too? At the end of this month the EduWiki Conference 2014 (Wikimedia UK ) comes to Edinburgh. I posted a couple of weeks ago about the TeachMeet we are trying to organise in the evening TeachMeet EduWiki, but there is another opportunity for some CPD. On Friday Afternoon (31st OCT) at 2pm there is a workshop: Wiki*edia Projects in Schools (for students under 18) the organisers have kindly offered teacher the chance to attend this session without signing up and paying for the conference. The Conference is at Edinburgh First’s St Leonard Hall (University of Edinburgh). Teachers who show up at the reception will be directed to the appropriate workshop. I know that some East Coast & other Local Authorities have timetables where pupils are off on Friday afternoon this might be an opportunity to find out more about Wikipedia and how it can be used in school. Most of the conference, and wikipedia educational direction, has, up to now, been directed at HE. I think there is a lot we can gain in primary and secondary education from a deeper understanding of wikipedia. It would be great to see folk come along to either the afternoon or to the TeachMeet and start a dialog between school and wikipedia. As a taster tomorrow evening (Wed 15/10/14) on Radio Edutalk 8:00pm Ally Crockford Wikimedian in Residence at the National Museum of Scotland. I’ve written several version of this post now, thinking about blogging, e-portfolios and CPD I am not particularly happy about this version but I don’t think I can get it clearer. What we noticed was that students started helping one another as much as we were helping students. One of the reasons for this was that each assignment was basically a detailed guide on how to use a particular tool, and each assignment asked the students to share their work with one another. They wouldn’t just sign up for Twitter; they would add the entire class to their account. They wouldn’t just sign up for a social bookmarking site; they would share their bookmarks with the class. Creating the community was built into the lessons. This class was not MOOC but it gave us the experience of letting the community, even the community outside of the classroom, drive the learning. Geoff Cain also mentions DS106 along side moocs in this post (which I loved and highly recommend) and I think beginnings to provide an answer to Joe’s problem. When I started blogging about my classroom practice and educational ict, in the first flush of teacher blogging in Scotland, I was convinced that most teachers would see the value of blogging, grasp the usefulness of RSS and blogging would become normal. This didn’t happen, although blogging is firmly embedded in a minority of teachers’ cpd, it is limited to what Joe calls usual suspects. The majority of teachers I talk to do not even seriously consider blogging as a cpd activity and I can’t see that changing easily. Blogs are still not really understood by a lot of teachers. I’ve been involved in a lot of training for glow e-portfolios and it has surprised me that few teachers read or understand blogs. What Geoff, ds106 and the Connectivist provide for and develop with their learners is community. This is the hard bit, our original bunch of ScotEduBloggers or the pedagoo folk have a great community, feel well connected and are open and welcoming to newcomers. I think more is needed. These sorts of community can still be intimidating to newcomers no matter how friendly. When my class started blogging there didn’t seem to be too much of a problem getting views or comments, not many schools were blogging. I often wondered how this would go when it became more common. If everyone is blogging their professional development who will read all the posts? This could be solved by following ds106 or QuadBlogging and organising people into groups. Another problem is that of ownership of spaces. There have been,attempts get teachers to share their experiences and expertise with other online, I made one that failed myself. I think part of the problem is that to get someone to got to a place not their own and jump through hoops to share is a big ask. Quadblogging, ds106 and some of the conectivist MOOCs allow folk to use their own spaces where they feel comfortable and use familiar tools. In turn, a single e-portfolio will be developed that will allow all teachers to document and record the outcomes of learning linked to the Professional Standards and the system of Professional Update being developed by the GTCS. It will be possible to access the e-portfolio through both Glow and myGTCS and Education Scotland and the GTCS will work together to ensure the e-portfolio is effective, well- designed and meets the needs of teachers. Other stakeholders such as local authorities should also be consulted to investigate whether they have any specific requirements of the portfolio. The e- portfolio will be ready to use by all teachers in Scotland in advance of the start of the August 2013 academic year. While I applaud the idea of teacher having a way to record their cpd online, and possibly share it with others, again I am not sure I have as much enthusiasm for a single e-portfolio. If we have learned one thing about online life and learning over the last few years it is the importance of personalisation and choice. Some folk are already recording, documenting and sharing their learning, perhaps not linked to the Professional Standards but valuable anyway. On arrival at college these students create their own blog. These blogs are aggregated into classes. As the students move through their education their blogs (or categories of those blogs) are added to various aggregations. The students are shown how to use a feed reader to view the aggregations that are interesting to them or for the classes they are currently involved in. As they move into employment they have the opportunity to continue their blogs, these are aggregated into schools, clusters, local authorities. When join in a CPD opportunity they can join that aggregation, follow it. Aggregations can easily be set up by lectures, schools, CPD organisers, anyone. University blogs would be compulsory at least for some of the course, profession not. I think we already have the technology to do this. 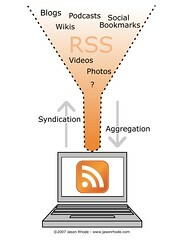 There are a few RSS aggregation tools, FeedWordpress, gRSShopper and River2 spring to mind. For arguments sake, lets say we use FeedWordPress. Students or teachers could create blogs with any system they like as long as it had RSS feeds. Using WordPress blogs with FeedWordPress anyone could build an aggregator, for example in college a lecturer would have an aggregator for their students, this would either pull in all posts of those students or ones with particular tags. The links to the posts and comments for the post are pointed to the original blog. The aggregator blog could then automatically add further tags. These aggregators could be themselves aggregated, all aggregators in a college or university pulled together for a site wide blog. Or someone with a particular interest, say a math lecturer could aggregate all the maths posts. Each aggregated post points back to the original comments stay on the original posters blog. The bloggers have ownership of their blogs, part of the induction could be setting up a domain of their own or using free services. The grouping would provide each blogger with a set of communities where they can work together, comment on each other’s posts a provide peer support. Something like Pedagoo could be built by setting up an aggregating blog pulling in, again for arguments sake, posts tagged pedagoo from members blogs, I am presuming that it will not be too hard to have some sort semi automatic signup for aggregating blogs and there would be minimal maintenance needed. For participants it will be much easier to contribute to groups just by tagging posts on their on blogs. This system becomes what the users want it to, bit at a time in a loosely joined fashion, it is not owned by the system, the participants are the system. 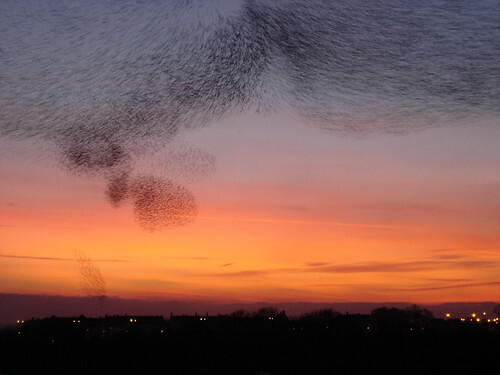 It is flexible ready to take advantage of new technology and serendipity. It is not reliant on any one player, holes are easy to fix, new alliances easy to make. Most of these ideas are based on the work at the University of Mary Washington, some links. We are probably at a moment when this is possible and fairly easy, glow blogs are beginning to be established, the idea of journaling cpd accepted, I wonder if there is any interested in a loose flexible system that gives ownership to participants? Last night I went along to Teachmeet Strathclyde at Jordanhill college, I had signed up a couple of days before and stuck my name down to talk about edutalk.cc. I noticed there were nearly 70 folk signed up and quite a crowd was gathered eating cupcakes when I arrived. This was the first TeachMeet I’d attended when I had not really though much about it or had any involvement with before hand. The participants were mostly students which gave the meet a slightly different energy, slightly more formal and organised than some TeachMeets, the crowd was quietly energetic and motivated. A couple of the usual suspects were in attendance but I didn’t know the vast majority of attendees. As usual for teachmeets the presentations were all interesting, with lots of things I either nodded to or was completely surprised by. The compare Paul Campbell kept everything running smoothly. I was nice to have a round table break in the middle, I went to a Games Based learning table organised by Morven Skinnder, Jen Deyenberg was in the group and has extensive experience in gbl. I suspect learning in Jen’s infant class would be wonderful with or without the high tech additions as I can’t imagine an object or situation she could not animate with learning. I’ll not go into details of the different presentations or the round table as I am currently chopping up the audio recording I took and posting to Edutalk I had my two minutes talking about Edutalk, should have done 7 as I expect that most folk went huh; without the chance to listen, or see a demo. I am quite pleased with the slide though. Edutalk is fairly pushing out the episodes at the moment, with the purpos/ed crew adding one a day for their #purposedfutured campaign and the audio from TMLothians11 – TeachMeet Lothians & Borders 2011 which I am (with permission) reposting on Edutalk. 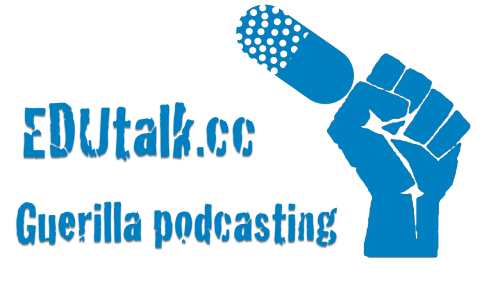 There is still plenty of room for move voices on Edutalk, see the How to EDUtalk to find out how easy it is to join in. 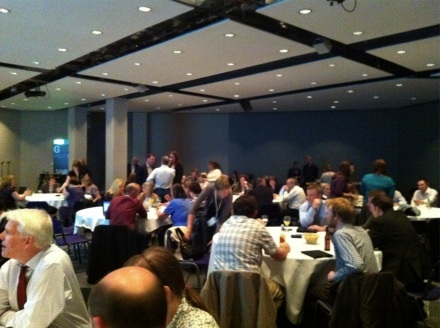 My photos from Teachmeet Strathclyde on my John’s posterous site and there is a Teachmeet strathclyde Edition – Stuff from the strathclyde Teachmeet posterous waiting to be filled up. On Wednesday evening I went along to TeachMeet and the TeachEat that follows. I’ve been lucky enough to have watched TeachMeets evolve (at least in Scotland, not made it out of the country yet) and this was one of the best yet. As usual the event was organised on a wiki by a bunch of volunteers. The lead organiser this year was David Noble of booruch fame. David, in consultation with others made a couple of changes to the program, in addition to the familiar 7 & 2 minute presentations we had a session of Round table workshops and one of World Cafe discussions. at these points we broke out into groups for various discussions. Ian Stuart discussed using Google Sketchup with International Connections, but the project included children making traditional drawings as a starting point and the stand out point for me was the way Ian’s pupils exceeded his expectations. Colin Maxwell talked about Charity events for teamworking and citizenship at college level, a great ideas that would equally fit into primary or secondary school. I’d didn’t catch if the video of the zombie walk is available but I hope it is. Margaret Vass spoke of her work with Glow Blogs and ePortfolios, Margaret is probably the most experienced primary blog runner in the country. Her ability to see and explain the good stuff that happens in teaching & learning is brilliant. Her post about the presentation: Glow Blogs and ePortfolios? should be read by anyone wondering if primary blogging is worthwhile. Sean Farrell‘s 2 minutes on ‘Logging into Glow: making it accessible to 5 year olds’ made me wish that more folk from LTS had been in the audience. Glow really needs this and needs it yesterday: simple safe logon for wee ones who find typing a glow username such as gw09johnstonjohn4 and a 8 character password (with one char not aphpanumeric) a bit difficult. From the number of teacher logins I’ve reset password for some of the rest of us could do with this too. The big problem with the round tables was deciding which one to go to. I choose Jennifer Harvey – Setting up a QR treasure hunt which triangulated well with 2 of my favourite 7 minute presentations David Muir –TeachMeet@SLF2010: QR Codes in Education and Jen Deyenberg – GPS and Geocaching – #TSMSLF2010. We are lucky to have Jen in Scotland. I am very interested in GPS in and outside education. Both QR codes and geocaching lend themselves to the mixing up of being outdoors and using technology. Jennifer’s round table proved to be the highlight of my TeachMeet and SLF she had, in 10 minutes, introduced me to some new iphone apps, got a table full of teachmeeters running round the room collecting audio, video and images and in true TeachMeet fashion had changed her gig to incorporate a pice of software she had found the day before. (some of the results: stickybits » barcode » Jenny not singing For the record my first video in this stickybit is useful). Fergal, who did a great job of keeping the presentations coming, created a posterous site: tmslf2010’s posterous which attendees were asked to populate by mailing post@tmslf2010.posterous.com, so far there are photos from the night, presentations and recording from presenters. I recorded all the presentation audio on my iRiver and am slicing it and posting to EDUtalk (and cross posting to tmslf2010’s posterous), this might take a bit of time. David Muir organised the FlashMeeting and you can watch the recording. The last part of TeachMeet was the World Cafe 9 tables discussing different topics. Again I would have liked to go to several, but went to How can we help TeachMeet evolve? which I was facilitating. TeachMeet Evolution ). There is a lot of background noise, 8 other World Cafes were going on at the same time. TeachMeet has always changed/is always changing. teachMeets can be small, someone had one in their living room. 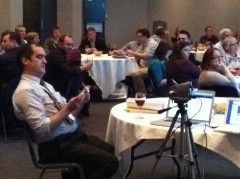 TeachMeet needs to be scalable. 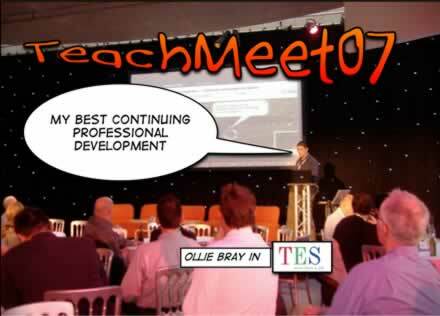 If there is a committee set up to take care of the TeachMeet brand do we have to ask/bid for funds from the committee. This perhaps gives to much power to a group. We had only just started scraping the surface of this when we ran out of time. Personally I think of TeachMeet as a way to recharge my batteries rather than something that needs to grow and expand. I like the unconference principals & ideas. I can also see the value of smaller TeachMeets. I liked the original idea which assumed that everyone who turned up was willing to speak if drawn out of the hat. A nice leveller. I dislike the idea that some folk should keynote without facing the draw. Although I like free beer and nice spaces provided by sponsors I have a knee-jerk reaction agains goodie-bags. I’d be happy with less salubrious venus and paying my way to avoid these. Back to basics might be an idea, just meet up and chat. One size does not fit all we should Let a thousand flowers bloom. Organising TeachMeets is quite a burden and usually falls on mainly one person. @eylanezekiel mentioned that BrainPop had offered to improve on the wiki to make it easier for folk to sign up. While I agree the Wiki is getting a bit of a mess (I deleted dozens of spam pages a while ago), I do not think a particular company should take responsibility for organising TeachMeet. It would be good to have clearer organisation. Perhaps an idea is for the central wiki to list upcoming TeachMeets, but each teachMeet provides a wiki or site to facilitate the organisation. This would allow individual TeachMeets to use a tool provided by say BrainPop or create their own wiki or use another system altogether. TeachMeets would not be limited to one page and would be easier to navigate. The sites could also be a repository for recordings, links to blog posts, resources etc. @eylanezekiel also mentioned the difficulty in try to help with sponsoring TeachMeet when there is not a central body (herding cats was mentioned), again I see this as an advantage. If there is no central body it cannot be taken over by a group or faction. The lack of a central body also should allow for different approaches to take place. Like TeachMeet as a whole these ideas are well though through but I am betting that is not too important, TeachMeet from the evidence of TMSLF2010 is alive & well. I also bet that I could enjoy and learn from a event that went against all of my preferences. A bit of a mouthful, but this is the title of our Scottish Learning Festival Seminar. We will be explaining how the EduTalk project kicked off at the Scottish Learning festival last year with SLFtalk which recorded the voices of educators attending the Scottish Learning Festival 2009. and grew from there. We will hopefully give practical demonstrations of how the technology works and explain the thinking behind it. It should be fun.